Via Marshall Poe’s New Books in History, featuring Brian Balogh’s A Government Out of Sight. Americans don’t like “big government” right? Not exactly. In the Early Republic (1789 to the 1820s) folks were quite keen on building up the (you guessed it) republic. As in res publica, the “things held in common.” The “founding fathers” – all “Classical Republicans” – designed a form of government that, though “checked and balanced,” gave the federal government significant powers. And throughout the 19th-century Americans asked the federal government to use those powers to do all kinds of things, many of them profoundly self-interested. 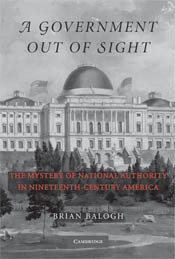 But as Brian Balogh points out in his thought-provoking new book A Government Out of Sight: The Mystery of National Authority in 19th-Century America they–that is, the American people–preferred that the federal government render aid in a certain way, namely, unobtrusively. Americans wanted the fed to help, but they didn’t want to see any feds. This created a system of “associative” government: the fed collected money (or incurred debt) and then distributed it to cities, counties, and states to get what it–and they–wanted done.